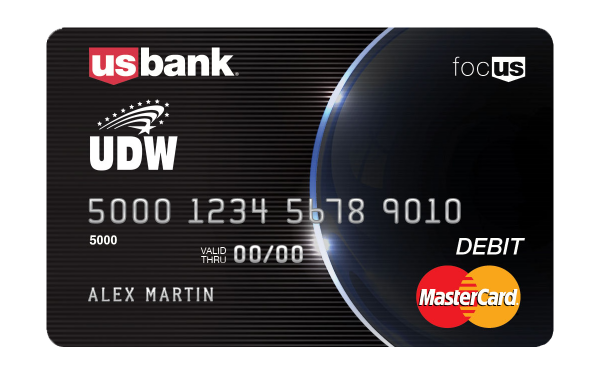 Introducing a new way to get paid, and a new way to pay – UDW is excited to announce our newest member benefit, the U.S. Bank Focus Card™. Get your IHSS pay directly deposited onto your Mastercard® branded prepaid debit card! UDW members can sign up online today here. Not yet a UDW member? Sign up here. Go here to request your Focus Card. Once you’ve completed the enrollment and your request is accepted, you should receive your card in a plain, white envelope with an Indianapolis, IN return address in 7-10 business days. You will receive your Focus Card account and routing numbers upon enrollment. Once you have this information, fill out the state’s IHSS direct deposit form available at www.udwa.org/directdeposit, and submit this form to the state. Proudly use your Focus Card everywhere Mastercard debit cards are accepted, including in stores, online, and over the phone. You also have several ways to get cash, pay bills, and track your spending. Get your card today! And be sure to check out the FAQs, and cardholder agreement at www.usbankfocus.com. You can view the fee schedule here. The Focus Card is issued by U.S. Bank National Association pursuant to a license from Mastercard International Incorporated. Mastercard is a registered trademark of Mastercard International Incorporated. © 2017 U.S. Bank. Member FDIC.